Want to Make Your Own Pinwheel? Use the Download Below! In 2002 the General Assembly officially declared September 21 as the permanent date for the International Day of Peace. International Day of Peace is also a Day of Ceasefire – personal or political. Take this opportunity to make peace in your own relationships as well as impact the larger conflicts of our time. Imagine what a whole Day of Ceasefire would mean to humankind. Pinwheels remind us of the peacefulness of a summer’s day and the joy of childhood. This project was begun in 2005 by two art teachers from Coconut Creek, Florida to involve their students in the International Day of Peace (Sept. 21). The tradition has continued worldwide. Last year, over two million pinwheels were “planted”. The idea is to make a pinwheel (from any material and of any size), to write ones’ thoughts and hopes for peace, harmony and tolerance on one side of the blades. These can be notes, prayers, poems or pictures. The pinwheels are then brought to a public place on September 21st and planted so the wind can take these messages of hope all over the world. This year pinwheels will be planted throughout the Greater Richmond Area in September and at the RVA Peace Festival on September 10th. 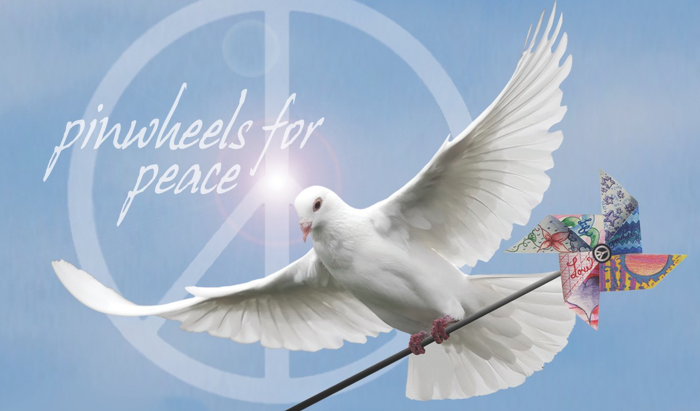 Include your organization’s location to the Pinwheels for Peace website and inform us at RVAPeace@gmail.com.